You're invited to a spaghetti dinner fundraiser, followed by the spring band concert on May 1st! See the picture for more details. 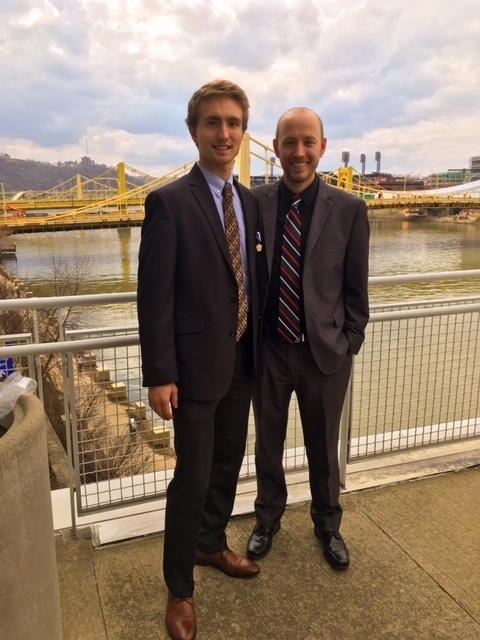 Nathaniel Maxwell performed as an All-State Choir Pianist in Pittsburgh, PA for the 2019 PMEA All-State/NAfME All-Eastern Convention. This marked his third performance at the All-State level! The National Junior Honor Society just donated $100 to the Tom Waltman weight room fund! Class of 2020: The Gertrude Hawk fundraiser due to be delivered on Monday, April 8th has been moved until Wednesday, April 10th. Pickup for parents starts at 3:30 in the cafeteria. Questions or concerns please contact Mrs. Pam Steele or the office. 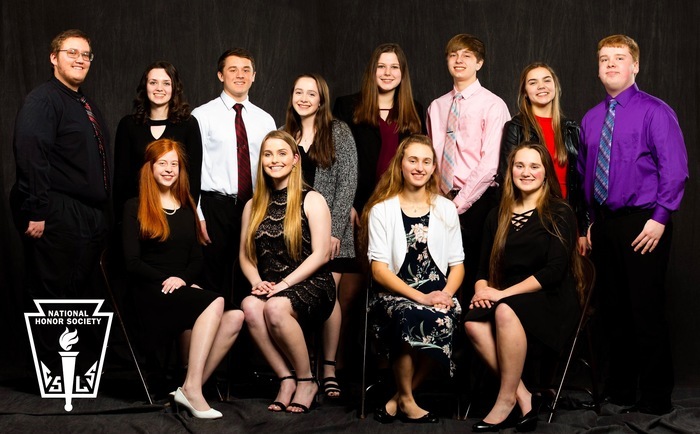 The Everett Chapter of the National Honor Society held its annual induction ceremony on Tuesday, March 19. Qualification for membership is based on the four pillars of NHS: Scholarship, Service, Leadership and Character. Twelve new members, along with their parents, were invited to the dinner which was held at the Breezewood Fire Hall. The new members inducted into NHS are: Lindsay Foor, Noelle Hendershot, Kaitlyn Maxwell and Alexandra Iseminger. In the back are: Leroy Clark, III, Allison Klavuhn, Cameron Mellott, Katelyn Graham, McKenzi Nesbitt, Kolby Weaver, Tori Steel and Matthew Wilt. The Scholastic quiz competition was held today, March 29. These Everett junior high students placed first and walked away with the championship. Congratulations to all. 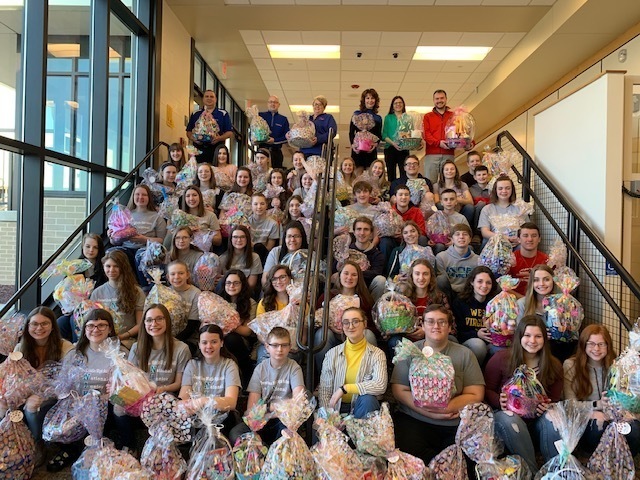 The NJHS and NHS worked together to collect over 130 Baskets for Eli. These baskets will be donated to hospitalized children to help spread kindness. Special thanks to all who assisted and to those who donated. Dear Parents, MS students will be participating in PSSA testing on the following dates and times. I encourage you to please try and schedule appointments and other events around these testing times. If you have further questions about the PSSA exam, please don't hesitate to contact Mrs. Criswell at 652-9114 x 1015. April 15 - 17 (ELA testing; Grades 6-8) during periods 1-3, April 30-May 1 (Math testing; Grades 6-8) during periods 1-3, May 2 - (Science testing; Grade 8 students only) Periods 1-3; and 4B-5B. Attention 6th Grade Parents/Guardians! We want you to know about something special we are doing in school. As part of our health curriculum, the students in your child’s classroom will view a film called “Growing Up and Liking It.” The film explains the physical and emotional changes boys and girls experience during puberty. After the film, there will be a question and answer session. Your child’s classroom will participate in this program on Thursday, April 18, 2019 at 1:00 p.m. Please refer to this permission form for more details: https://5il.co/6yka. Thank you! In an effort to give parents accurate information about events occurring at school, the Everett Area School District would like to notify you that pepper spray was brought to school today by a student and sprayed in a public area. No students were directly sprayed. Administration was immediately notified and steps to ensure students safety were put into place. Any students and staff affected were screened by our school nurse. We want to remind parents and students that pepper spray is not permitted on school property and is considered a weapon. Any question please contact administration. You can help deserving seniors in the Everett School District who earn the Spirit of Life Award in memory of Mrs. Lindy Dodson. Just place your order online and use the campaign fundraiser code 43912. Schwan's will then donate 20% of your order total to Spirit of Life account. 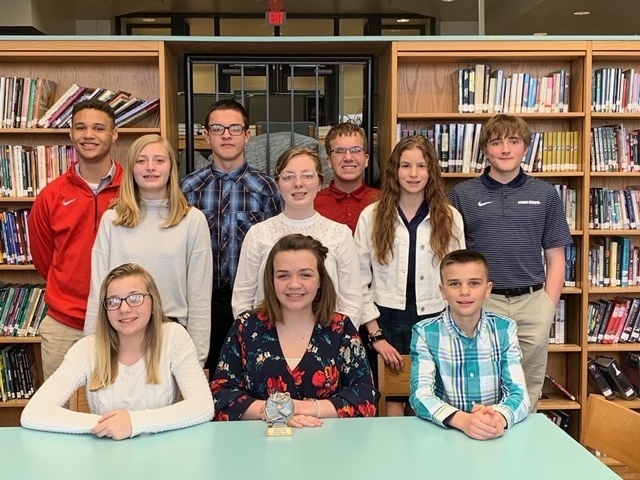 The Everett Area Sr. High Reading Competition team recently took 2nd place at the IU 08 Reading Competition at Bellwood Antis. Great job everyone! High School and Middle School picture make up day has been rescheduled for October 22nd at 8:00 a.m. in the HS/MS auditorium. Boxtops are being collected at the Middle School/High School. They can be turned into any teacher or Mrs. Bowman, the Boxtops coordinator. Have your students check with their teachers for any submission incentives. The school day’s over. What’s next? Do you want to hang out with friends? Learn what your future career might hold and have an edge on every other job seeker for that summer job or career after you graduate? Are you interested in STEAM activities? The best part of all of this is that it's FREE!! If it sounds too good to be true - it’s not! 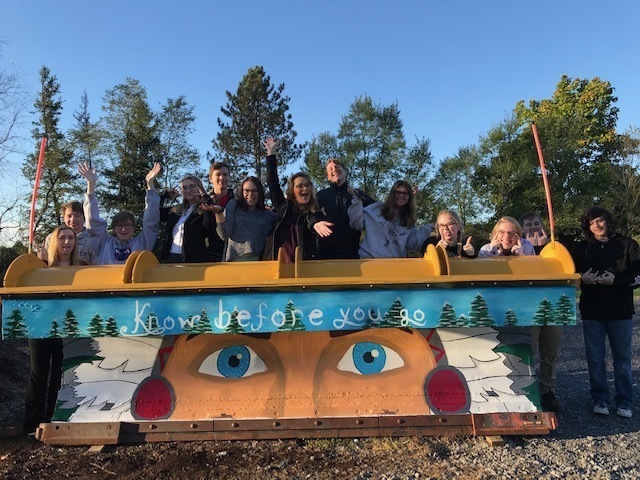 These and other activities are part of the new “After 3.” Everyday, students in grades 6-12 have a chance to explore their interests, learn new skills, have fun with friends and get help with school work. "After 3” is offered Monday’s through Thursday’s from 3 to 6 p.m. with transportation provided home. Come join the fun! You can find the enrollment form here: http://5il.co/4kxi. The Everett Area School District wishes to thank M & T bank for their generous donation of planners for our students. It is greatly appreciated. Thank you! Parents, along with filling out the PIAA comprehensive initial pre-participation physical evaluation, this cover page must also be filled out and submitted: http://5il.co/4e1t. Thank you. Grade 7 & 8 students and their parent(s) can come to pickup their chromebooks on 8/13 from 4-8 p.m. Please take time to review the online handbook prior to this date. Parents will be expected to complete necessary paperwork. There is a $20 insurance fee per student also which needs to be paid prior to chromebook pickups. Reminder, there will be a 6th grade orientation for 6th grade students and parents at the Everett Area Middle School from 5 p.m. until 8 p.m. on August 16th. Starting August 8th, the track will be closed due to construction until further notice. Parents, if your child is planning on playing sports you must fill out this PIAA comprehensive initial pre-participation physical evaluation. You can find the form here: https://www.piaa.org/assets/web/documents/Section%20VII%20Forms.%20CIPPE_FORM_SECTIONS_1_2_3_4_5_6_7_8_AND_9_(no_shading)(1).pdf. Only sections 1-6 are needed for the regular physical, sections 7 & 8 for re-certification for a different sport, and section 9 for minimum wrestling weight. ​Parents and Students, There will be Jr. High soccer practice every Tuesday and Thursday from 6 p.m. - 8 p.m. at Everett Elementary. Official practice will begin August 13th, and will be held Monday through Friday from 5 p.m. - 8 p.m. at Everett Elementary. When school starts on Monday August 20th, practice will be Monday through Thursday from 3:30 p.m. - 5:40 p.m. at Everett Elementary. With Amazon Prime's Prime Day coming up, remember to log in at https://smile.amazon.com/ch/25-1690999 so that part of your purchase goes to the Everett Renaissance! Incoming 6th grade students are invited to attend the MS orientation on August 16th at 5:30 p.m. Doors will open at 5 p.m. Parents are also invited to submit the $20 for Chromebook insurance that evening as well. Congratulations to Kaitlyn Maxwell for placing at the PIAA track meet in Shippensburg on May 31st! Be sure to check out the newest news article to see where you can find the 2018 summer edition of the Warrior Way and see all of the great things happening at EASD! The Varsity Track Meet scheduled for April 19 th at Everett was postponed due to weather conditions and field conditions. We will make up the Track Meets as follows: Tuesday, May 1 at Tussey - we will score Fannett-Metal at this meet. Wednesday, May 9 at HOME vs. S. Fulton and Williamsburg, 4:00 PM. The Varsity Baseball and Softball games scheduled for April 19th at HOME have been rescheduled for Friday, May 18. The Varsity BA/SB teams will be dismissed at 2:35 for this game.